Do you have a termite problem? No one wants to talk about bugs, but they’re far more common than you think. According to the National Pest Management Association, termites cause $5 billion in structural damage every year. Termites destroy homes of all shapes and sizes, gnawing through the wooden bones of your house. But that’s not the worst news. Unfortunately, homeowner’s insurance universally excludes damage caused by wood-destroying termites. Whether you own a home or plan on buying one, it’s your duty to protect your investment and ensure your property is free from these silent destroyers. Here’s what you should know before termites become a serious problem for your home. Termites may be common, but so are misconceptions about these frustrating insects. When it comes to termite control, you need unbiased, accurate information to make informed decisions – and pest control companies trying to sell you on their treatment systems may not give you the best advice. While many hardware stores offer DIY termite treatment kits, they aren’t a good value. Bait stations made from cardboard degrade quickly and need frequent replacement, which costs extra money. Studies conducted by Texas A&M University failed to demonstrate their efficacy. Partial treatments cost less, but they don’t necessarily provide a better value unless the infestation is localized, which is difficult to determine. Additionally, pest control companies that perform these treatments typically offer a limited warranty that doesn’t protect you from recurrences or structural damage. In most neighborhoods, termites are ubiquitous. This doesn’t mean that your house is infested or requires treatment. Termite monitoring services may pressure you into purchasing unnecessary services because termites are feeding on tree stumps, firewood, garden mulch and readily available sources of cellulose. Approximately 50 termite species inhabit North America, but only a few cause structural damage and economic losses. These are the most important types. Subterranean Termites: Several subterranean termite species in the genus Reticulitermes are native to North America. These wood-destroying pests infest homes from the ground upward. If wood isn’t in direct contact with the earth, they can build earthen tubes that travel along walls and foundations. Subterranean termites are most active in the southern states where the soil is warmer and humidity levels are higher. Drywood Termites: Unlike subterranean species, drywood termites nest within the wood that they consume. They are larger and darker when compared to subterranean termites. 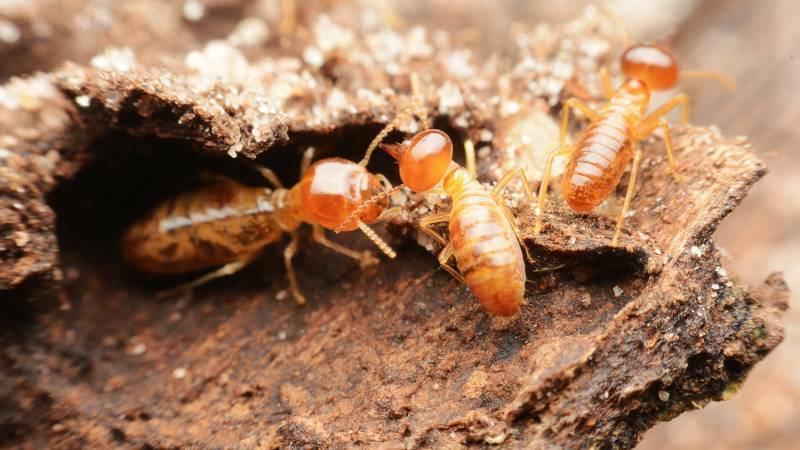 The western drywood termite, according to the University of Florida, is one of the most active wood-destroying pests in the Southwestern United States. In addition to damaging homes, they consume furniture, books and wooden trim. Western drywood termites are also found in Florida and along the Gulf Coast. Dampwood Termites: Dampwood termites only cause occasional structural damage. Measuring over half an inch long, these are the largest termites in North America. Dampwood termites inhabit moist timber and require high humidity. They don’t forage underground but may live in damp timber that’s touching the soil. Controlling moisture sources, recognizing warning signs and removing wood that’s in direct contact with the ground are always helpful for preventing termites. However, if you’re building a new home or treating an active infestation, you’ll have to consider possible treatment methods. Termite bait stations have rapidly gained popularity since they were introduced in 1995. Name brands include Advance, Isopthor, Sentricon, Shatter, Terminate and Trelona. These products contain insect growth regulators, such as noviflumuron and hexaflumuron. Workers that feed on the bait carry this slow-acting termiticide back to the colony, which eliminates the entire population. Self-contained bait stations are sometimes installed before new constructions. They’re useful for controlling all types of subterranean termites, although they do take longer to work. Bait station systems are generally costlier due to the regular maintenance visits needed. There are two types of liquid termiticides commonly used by pest management professionals today: repellant or nonrepellent solutions. Repellent termiticides contain pyrethroids sold under a number of different brand names, such as Biflex, Demon and Dragnet. Nonrepellent products contain ingredients like chlorfenapyr, fipronil and imidacloprid that are carried back to the colony by foraging workers. They work by disrupting the termites’ nervous system. Common brand names include Phantom, Premise and Termidor. These products work quickly and remain active for up to five years. Chemical spot treatments must be applied directly to the affected wood, so they’re most effective for managing localized infestations of drywood or dampwood termites. To control infestations successfully, your pest control operator must pinpoint the problem zone and use the proper application method. This generally involves drilling through lumber so that the active ingredient reaches the target. The efficacy of spot treatments varies, so they work best in conjunction with barrier methods or bait stations. If you’re concerned about visible termite activity or interested in preventive treatments, there are many resources available online. A simple online search will give you the information you need, from professional pest control options to information about management and extermination. You can learn more about the latest treatment options by searching online, too. Don’t let termites ruin your house and disrupt your life. Take charge to protect your biggest investment. To schedule an inspection or to hire an exterminator, you need to do your research to find a professional who’s qualified, experienced, and within your budget. Interested in learning more about termite extermination? Start a search today.